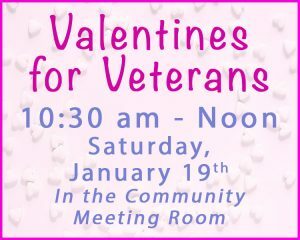 Join us at Brooks Memorial Library at 10:30 am on Saturday, January 19th, for a morning of card making for our veterans, some of the many men and women who have given so much in service to our country. This workshop is absolutely FREE, and all materials will be provided. It is sponsored by the Brattleboro Chapter of the Daughters of the American Revolution, and Brooks Memorial Library.